There is a simple equation that always holds true with clipless pedals: control = comfort. By securing your feet in place with a clipless pedal you can use muscles more efficiently, relieve excessive strain on your feet and be connected to your bicycle more directly. Read on to see how easy it is to learn to ride “clipless”. Before the clipless pedal, bicycle riders would install baskets and straps (toe clips) on their pedals. Why would you call a pedal that you clip into “clipless”? Before the clipless pedal, riders would install baskets and straps (toe clips) on their pedals. Then, in the 1970s, a company called Look used ski binding technology to create a pedal that would retain a rider’s foot and allowing them to free themselves easily. This invention was called the “clip-less” pedal because it did away with the need for toe clips. Today, there are many clipless pedal designs. Each one is suited for a different riding style, but function similarly. 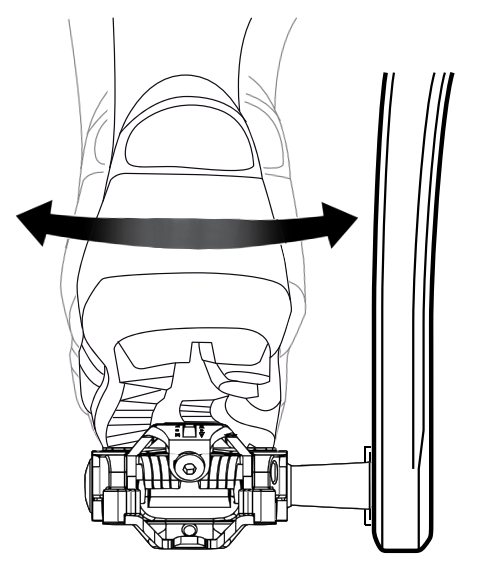 Clipless pedals use a retention mechanism to hold the cleat in place. This retention mechanism needs to have enough spring tension to hold the cleat under effort, while still allowing the rider to easily disengage. Some pedals have adjustable spring tension while others are fixed. The cleats is the item attached to your shoe that clips into your pedal. So, the cleat material has a large influence on how easily they clip in, float, and clip out. The most common cleat materials are brass, steel, and plastic. Brass is a great wearing material, that corrodes at a very slow rate and clips in and out incredibly smoothly. Steel on the other hand, has an even greater wear life, but corrodes more quickly. Finally, Plastic cleats wear very quickly, but can be designed to clip in and out smoother than any other material. 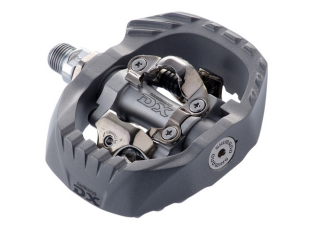 The requirements of an offroad pedal are that they need to work in all conditions, use a small cleat, and be durable enough for the occasional rock strike. Because of these requirements most offroad pedals and cleats are made of metal to be very durable. They also have bodies that are designed to clear mud and debris easily. Of all the clipless pedals on the market the most popular pedal is the SPD. SPD pedals have an engagement mechanism on both sides, with adjustable tension and use a steel cleat. Another very popular brand is the Crank Brothers Egg Beater series. These pedals engage on 4 sides, use a brass cleat, but have no adjustment for tension. Another great option for offroad riders is a platform pedal with a clipless mechanism built in (see image). That platform gives the rider foot stability and the ability to pedal while they work to clip in. 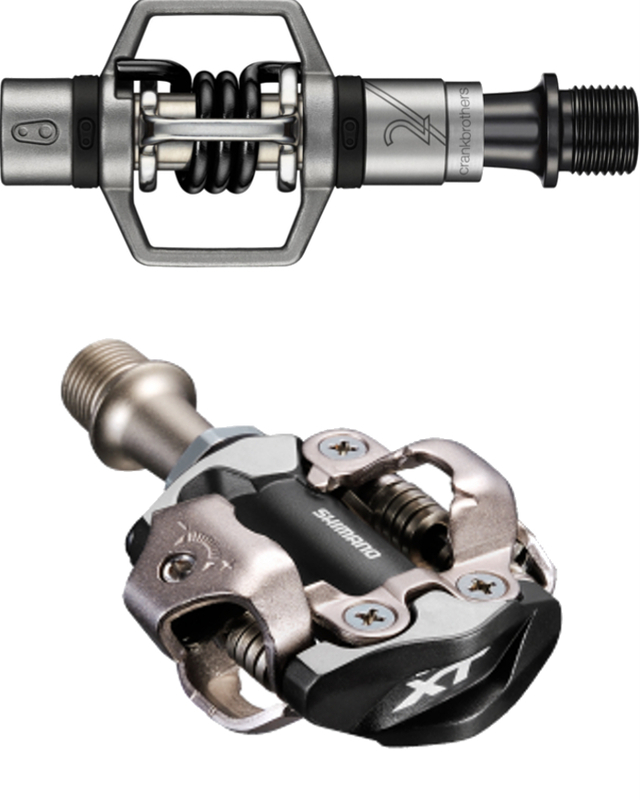 Many riders who are new to clipless pedals love this option because of the stability it offers if you are clipped in or not. The benefits of clipless are something all riders can enjoy. Therefore, even if you are riding bike paths or rail trails, clipless could be good for you. With that in mind, the most popular type of clipless for recreational riders is the ½ and ½ pedal. The ½ and ½ have a clipless mechanism on one side, and a flat pedal on the other. This makes them versatile enough to clip in on longer rides, or just pedal around in sneakers for short spins. 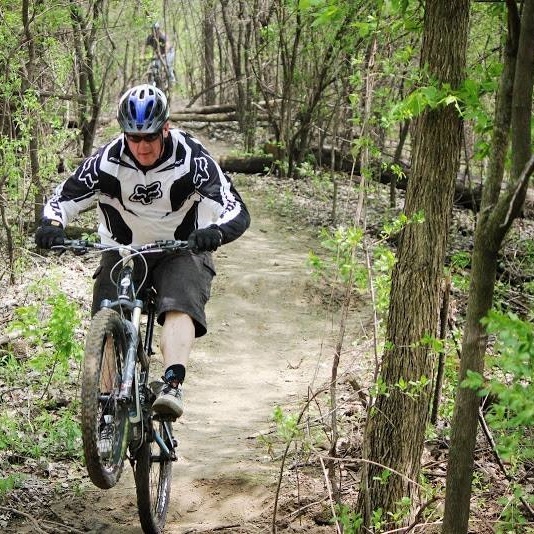 Like Offroad riders, some recreational riders like a clipless platform pedals for their versatility and stability. For competitive road cyclists, the requirements of pedals are very specific. They need their pedals to direct all their effort into the bike without compromise. 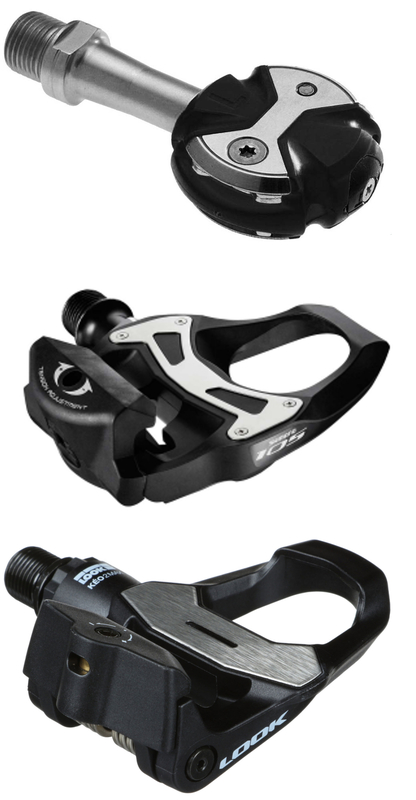 Therefore, road pedals have a larger platform and cleat than other pedals. Because of the very large cleat, road shoes have almost no tread on them. Additionally, most road cleats are made of plastic so they can hold tight under effort, but release easily. 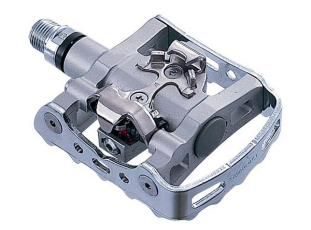 For road pedals the most popular brands are Shimano and Look which operate similarly. They both use plastic cleats, and have adjustable tension. The unique Speedplay pedal is another very popular pedal for road bikes. 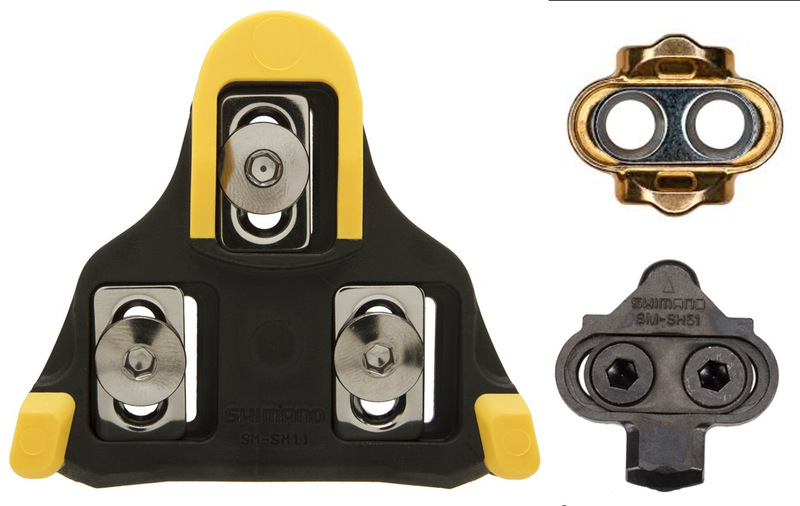 Speedplay is unique because they incorporate the retention mechanism into the cleat rather than the pedal and offer the largest amount of float of any brand. While on the subject of pedals, we should also talk about cycling shoes. Cycling shoes have a stiff sole to disperse pedaling pressures along the entire length of your foot. For competitive riders, the key to a good shoe is the stiffness of that sole. For more recreational riders, it is important to consider comfort over efficiency. Determining comfort on cycling shoes is different than that of normal shoes. 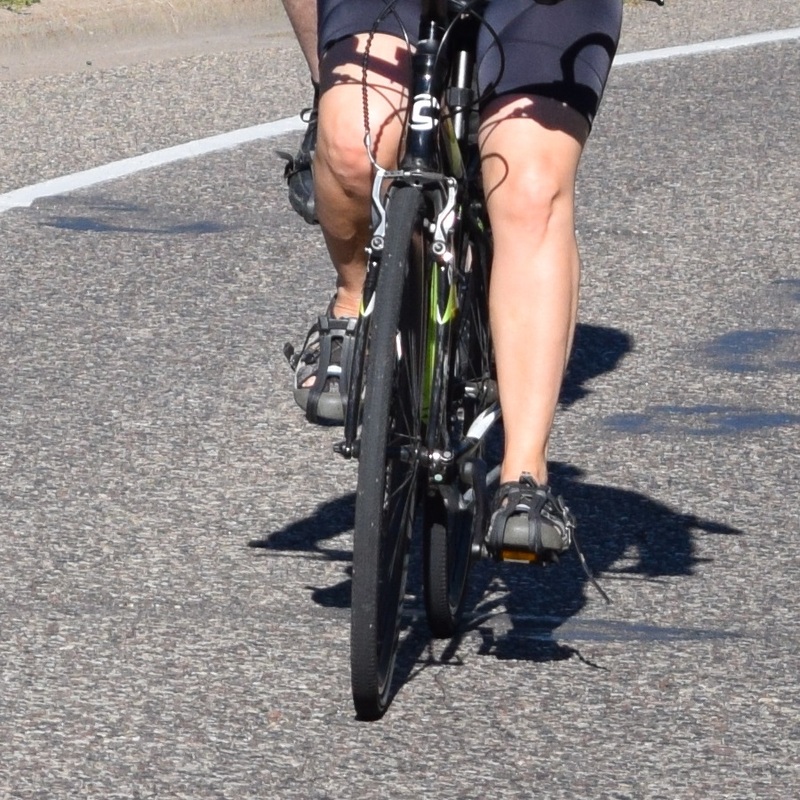 First off, in cycling shoes, your feet are trying to pull out of the shoe throughout the pedal stroke. This means that you want the shoes to fit as snug as possible. It is OK for your toe to feather the front of the shoe if you try. Second, most cycling shoes are made of synthetic materials, which stretch over time. This means that they will only get bigger as you use them. Notice, the cyclist in blue has clipless pedal making each pedal stroke easier. Good pedals and shoes can make a big difference in how comfortable your ride is. Be sure to find the right product for you, and practice how to use them. 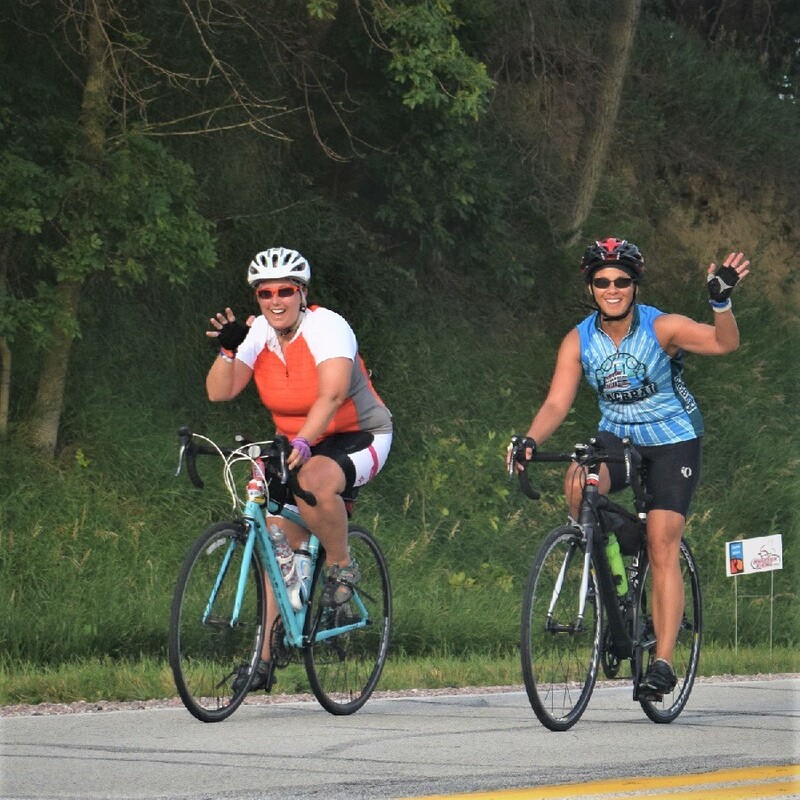 This entry was posted in News, riding tips and tagged #SPD, biike pedals, bike riding, biking comfortably, clipless pedal, comfortable bikin, crank brothers, crank brothers egg beater, crank brothers pedal, egg beater, egg beater pedals, issi, LOOK, Look pedals, riding efficiency, Time, Time pedals on August 19, 2018 by John Brown.